The information below is from Hudson River Park website. Later I will post pictures of some piers. In a city as dense and diverse as New York, Hudson River Park will be many things to many people. It will be a place where park-starved New Yorkers can soak in the sun or celebrate the seasons. A place where parents and teachers can help educate their children about the ecology and history of the Hudson. A place for running, playing, dancing, boating, or simply watching the boats sail by. A place for relaxing with your friends and neighbors. A granite esplanade will span the entire five-mile park, bringing the public close to the water, while town docks, boat houses, a beach, and launches for canoes and kayaks will allow people to touch and even enter it. Back on land, undulating green lawns and groves of trees will separate walkers from the New York's finest bikeway. Ballfields will open for both children and adults. But the best part of Hudson River Park will be the piers. Stretching up to 1,000 feet into the Hudson River, thirteen rebuilt piers will allow park visitors to leave the city behind them and experience the light, water and open space that are unique to the riverfront. Hudson River Park's piers will be islands of repose in the midst of our vibrant city. Green shorelines, blue waters and open sky became the focus when planning for the park began over a decade ago. Since then, park planners have continued to work extensively with local communities, environmental organizations and businesses to create a living, breathing park for all visitors. In 1998, the Hudson River Park Act officially created the park, reserving extensive portions of the waterfront exclusively for public recreation, and significantly limiting the types and locations of commercial activities. The Act also designated the river itself an estuarine sanctuary, and requires that every dollar made within the park goes right back into the park's construction, maintenance or operations. The estimated park cost is $330 million. Both the State and City have already each committed $100 million to the project. The remainder will come from a combination of sources, including lease revenue and private fund-raising. Much of the project's cost will be for infrastructure —rebuilding the pier structures, seawall, and the underground platforms which support the riverfront land. Those underground and underwater structures were built largely of wood in the 19th and early 20th centuries and must be replaced. The remaining capital expenses are for traditional park amenities like pavings, gardens, benches and lighting. Hudson River Park's first section opened in Greenwich Village in September 1999, and further sections are under construction. The projected date of completion is 2005. Hudson River Park begins at Battery Place with a bikeway and walkway that will continue along the entire length of the park to 59th Street. From there, it will connect to the Riverside South Park (also under construction), and Riverside Park. This is the beginning of the Hudson River Valley Greenway Trail, which will eventually run all the way to Troy, north of Albany. Today:*The area between Battery Place and Harrison Street is the only part of the park without a river view. Between West Thames and Albany Streets, there is a children's playground, basketball court, community garden plots and a dog run. Tennis and basketball courts are located between Murray and Warren Streets. Pier 25 provides a small "town dock", a snack bar and a sand area for beach volleyball. A miniature golf course is open from May to October. The "Yankee," the last surviving Ellis Island ferry, is docked here. Pier 26 is the home of the Downtown Boathouse (www.downtownboathouse.org ), where members can store small craft like canoes and kayaks, and the public can borrow them or launch their own boats for free. The River Project (www.riverproject.org), an ecological education and research center, is also located at Pier 26. Pier 32 is a deteriorated pier, now severed from the shoreline. Birds and other wildlife are now claiming it as their own. Pier 34 contains two "finger" piers that link to the Holland Tunnel Vent Shaft. The southern finger is open to the public for strolling, sitting, blading or fishing. The northern finger is reserved as access for maintenance for the vent shaft. An art installation by Ron Baron, entitled "Birds," is currently located between the fingers. In the future: The southern end of the park will feature a plaza linking Hudson River Park with Battery Park City, historic Battery Park, and the East River Esplanade. Park activities here may include active recreation, a community garden, a dog run, and a children's playground. The waterside esplanade (which will continue to the northern end of the park) begins at Harrison Street. Piers 25 and 26, located at the North Moore Street Gateway, will both be fully rebuilt as public park piers, with an emphasis on ecology and boating. Pier 25 will feature flexible areas for both active and passive recreation, children's play areas and a clam bar or similar concession stand. Moorings south of the pier will accommodate 40 boats, and a "town dock" will provide short-term docking for small craft. Historical ships and a water taxi will dock here, too. Pier 26 will continue to house an "estuarium," an education and research center, with demonstration gardens, interpretive science exhibits and classroom space devoted to the Hudson River. A boathouse and launch for non-motorized boats will be located here as well. Pier 32 will be an ecological pier with a get-down and lookout on the bulkhead. Pier 34 will continue to offer access for fishing and other activities on the southern finger. Consideration will be given to opening up the northern finger as well, if the Port Authority's operational needs for the Holland Tunnel Vent Shaft do not conflict. Today: The temporary walkway continues north throughout this area, and the NYS Department of Transportation has completed the dedicated bikeway/bladeway between Clarkson and Horatio Streets. Located at the end of Houston Street, Pier 40 is the largest pier in the park and is 95 percent commercial. Pier 40 Operating LLC maintains a public esplanade around the perimeter, and provides 2,300 long-term parking spaces, plus areas for excursion boats, police storage, truck and bus parking, and other uses. Hudson River Park operates two children's athletics fields for soccer and baseball, as well as some indoor recreational space. The Pier Park and Playground Alliance (www.pier40.org ) operates batting cages and other recreational facilities. The Tamaroa is berthed on the north side of Pier 40. If you've read or seen The Perfect Storm, you'll recognize this decommissioned US Coast Guard vessel as the heroine of the story. Pier 42 (at Morton Street) is closed due to pier condition. Pier 45 is open for public use, but contains no amenities. Just to the north, a bow notch reminds us of the days when the ships became too long for the piers, and the bulkhead had to be pierced to accommodate the extra length. Piers 46, 49 and 51 are condemned and unused. The Gansevoort Peninsula is actually landfill. It is mostly devoted to municipal services: NYC Sanitation Department truck parking, salt storage, an unused marine transfer station, and Fire Department Marine Company 1. Historical Note: Thirteenth Avenue. Manhattan once had a well-used Thirteenth Avenue. It ran from Bloomfield Street on what is now Gansevoort Peninsula all the way to 23rd Street. The area was later excavated to permit newer, longer ships to dock without blocking the channel. Today, only a one-block stretch remains on the Gansevoort Peninsula. Pier 54 (at 13th Street) is a flat open pier that provides public access. It is distinguished by a steel arch — the remains of a once-grand building built for ocean liner passengers. Historical Note: Famous Tragedy: Look closely at the entrance arch at Pier 54, and you'll see that it was once a Cunard-White Star pier. It was the departure point for the Lusitania's first voyage. It's also where the Titanic's survivors returned onboard the Carpathia. In the future: At least half of Pier 40's 1.2 million square feet will be reserved for public park uses, with the rest devoted to compatible park/commercial activities, such as long-term parking. Detailed design of this pier is still to come, but its re-creation may involve demolition of parts of the eastern and western walls to open up more views. The perimeter walkway will be preserved and enhanced, and the courtyard and roof will likely become a 10.5 acre public park with lawns, sports fields and courts, and terraces. Other uses could include restaurants, performance space for arts companies, a boat showroom, and a water taxi stop. Pier 42 is reserved solely for park uses, but its rehabilitation awaits completion of the other public piers. Future recreational activities might include in-line skating and flexible active space on the eastern portion of the pier, boat slips for non-motorized boats, and, on the western portion, lots of space for sedentary folks to sunbathe, read or relax. Pier 45 will be one of the first piers to be reconstructed. It will feature a lawn, wooden boardwalks, open shade structures, seating areas, sun decks and plantings. It will also have a water taxi stop on its south side near the bulkhead . Pier 46 will emphasize active recreation — such as flexible ball play — on its eastern portion and a perimeter walkway. A western walkway extension of the pier will allow close-up viewing of the adjacent ecological pier. Pier 49 will become a pile field and viewing balcony. Pier 51 is slated to become a children's play area and will include water features. Following relocation of the essential services provided by the Department of Sanitation, the Gansevoort Peninsula will be filled with ball fields, a children's playground, and a sunning beach. Other possibilities include a boating center, overlooks and a water taxi stop. Fire Department Marine Company 1, Manhattan's only remaining waterside fire station, will remain on Pier 53, and three seasonal floating docks will be added on its north side to provide slips for about 60 small boats. Pier 54 will become a public pier featuring the arch and granite bases from the original pier structure. Historic vessels will be docked and interpreted, and a terraced, wooden boardwalk deck with lounge chairs and some active recreation could also be included. Today: The interim bikeway/walkway runs along the West Side Highway from 14th - 34th Streets, but is narrow in some areas due to construction. An irregular area between 14th and 15th Street east of Route 9A currently includes a temporary dog run. Pier 57 is used for municipal bus parking. Historical Note: A Floating Pier. Pier 57 is eligible for the State and National Registers of Historic Places. It was built in 1952 and is significant because of its innovative engineering design by Emil Praeger, who designed floating piers for Allied landings in World War II. Pier 57 is supported by three buoyant, hollow concrete boxes. These 27,000-ton sections were built in Haverstraw, NY. Upon completion, they were flooded and floated down the river to their current location. The pier's method of construction was widely heralded and publicized in engineering journals at the time. Pier 58 is a pile field. Piers 59, 60 and 61 and their head houses are operated by Chelsea Piers Management (www.chelseapiers.com) under a long-term lease as a sports and recreation complex, featuring a golf driving range, a marina, two ice skating rinks, a bowling alley, a track and gymnastics center, commercial excursion boating, television and film studios and restaurants. A public pedestrian walkway hugs the perimeter of each pier. Historical Note: Piersheds at Piers 60 and 61. These two piersheds are rare surviving examples of early 20th Century passenger ship terminals. Designed by Warren &amp; Wetmore, they were completed in 1910. They remain intact, with the original materials and some original equipment, and have been restored by Chelsea Piers Management. Two temporary in-line skating rinks operated by Chelsea Piers are located on Pier 62, and a landscaped public area occupies the western and southern sides of the pier. Pier 63 currently houses Basketball City (www.BasketballCity.com) and the Equestrian Center. Immediately west of the building is Pier 63 Maritime, a barge offering public access and a variety of boats including the historic Frying Pan. Historical Note: The Lightship Frying Pan, located at Pier 63 Maritime was built in 1929 and served as an offshore floating lighthouse in the Atlantic Ocean at Frying Pan Shoals, 35 miles from the mouth of Cape Fear in North Carolina. It was later moved to Cape May, NJ, then to Southport, NC, then to Maryland, where it sank and sat underwater for three years before being raised and brought to New York. Pier 64 is condemned; the pier shed is empty. A pier headhouse was demolished in mid-1997 to make room for public access. On the eastern side of Route 9A, Thomas F. Smith Park has been dramatically expanded and will become part of the enlarged Chelsea Waterside Park. The bulkhead area north of Pier 64 to 30th Street is being used as a staging area for the Route 9A Reconstruction Project. Pier 66 and Pier 66a are unusable due to pier condition. A heliport operated by Air Pegasus is located on the bulkhead between 29th and 30th Streets. Pier 72 (at 32nd Street) is condemned. Historical Note: The Baltimore &amp; Ohio Railroad Float Transfer Bridge (Pier 66a), just north of Pier 64, was an active railway transfer point from 1954 to 1973, linking the river with the B&amp;O Warehouse on Eleventh Avenue and 26th Street. The float bridge was constructed with a wooden Howe truss (patented in 1840) to handle the twisting stresses of transferring railroad cars to barges. It is listed on the State and National Registers of Historical Places. Hudson River Park Trust is currently restoring this structure, which will become a living reminder of the commerce that once dominated life on the Hudson. In the future: The park between 14th and 15th Street east of Route 9A area will become part of the park as soon as it is no longer needed to highway reconstruction staging. A permanent dog run will be located here. Decking and piles at Pier 56 (at 14th Street) will be removed and a small area will be rebuilt to provide public access over the river. When the buses are moved from Pier 57, public esplanades will be created on the northern and southern sides. Piles at Pier 58, which is severely deteriorated, will be removed. Piers 59, 60 and 61 will remain as the Chelsea Piers Sports and Entertainment Complex. Chelsea Waterside Park, between 22nd and 24th Streets, will be one of the largest park areas along the river. It will include Piers 62, 63 and 64, and large land areas on both the eastern and western sides of the roadway. The eastern portion is being built by the Route 9A Project and will be completed this year. It will include athletic fields for soccer and baseball, a basketball court, a children's playgrounds, food concessions and comfort stations, and a dog run. Piers 62, 63 and 64 will all become public park piers featuring views, sitting and playing areas. At Pier 66a, the restored Baltimore &amp; Ohio Railroad Railroad Float Transfer Bridge will allow 21st Century park visitors to learn how cargo once moved on the river. A small boat launch will also be included here. Pier 66, just north of the Floatbridge will be rebuilt to provide a public boat dock for day-time tie-ups for up to 20 boats, and a viewing and sunning area at the western tip. A boathouse on the bulkhead will house approximately 150 small craft. Pier 72 will be removed and its pilings will be retained to support wildlife. Another shoreline beach will be constructed south of Pier 76. Today, this portion of the waterfront is still alive with commercial maritime uses such as tour boats and river ferries. In the future, these thriving activities will continue and be enhanced by walkways, landscaping, another public pier and other public amenities. Today: Pier 76 (across from Javits Convention center) is currently a City Police Department tow pound. Pier 78, and the land adjacent to it, is the New York Waterway Ferry Terminal (www.NYWaterway.com), and is privately owned. It provides ferry service to Weehawken and Lincoln Harbor in New Jersey, as well as excursions. It also runs a bus service for commuters and theatergoers. Pier 79 contains vents for the Lincoln tunnel and a bus garage for New York Waterway. Piers 81 and 83 are home to World Yacht (www.WorldYacht.com) and Circle Line (www.CircleLine.com), which together offer luxury dinner cruises and tours around the island of Manhattan. A small concession stand is located near Pier 83. Pier 84 is open for interim public recreational use, and will include a community garden, seating, lighting, and a boating area. Pier 86 houses the Intrepid Sea-Air-Space Museum (www.Intrepidmuseum.org), and other historic vessels. In the future: The waterfront esplanade and bikeway/blade way will continue through this area. At least 50% of Pier 76 will eventually become part of the park following relocation of the tow pound. The remainder will remain under New York City control and likely be used for commercial purposes. Pier 78 will continue to be used as the New York Waterway Ferry Terminal. Pier 79 will also become a ferry terminal, and will include public access and viewing areas. Piers 81 and 83 will continue to be used by World Yacht and Circle Line for tourist and excursion boats until at least 2017 and 2016, respectively. Pier 84 will be programmed entirely for park uses and could include town docks with day slips for small boats, sitting areas, a community garden, and a boathouse. Water taxis will stop here as well. The Intrepid Museum will continue at Pier 86. Today: Piers 88, 90, and 92 are the Passenger Ship Terminals and are not part of the park. Pier 94 is also known as the "Unconvention Center." It is used for trade shows and is not part of the park. Piers 95 and 96 are closed due to pier conditions. Pier 97 is used for sanitation truck parking. Pier 98 is used for Con Edison employee car parking, a training facility and delivery by barge and storage of fuel oil. Pier 99 is a Sanitation Department marine transfer station. In the future: Piers 88, 90 and 92 will continue as passenger ship terminals. Pier 94 will be used for trade shows or other commercial purposes as decided by the City of New York. North of Pier 94 through and including Pier 97 will be the new Clinton Cove Park. Pier 95 will have a get down near the shore, and Pier 96 will have a small boathouse; the remaining piles and decks on both piers will be removed. Pier 97 will be used for passive and active recreation, with a boardwalk, flexible court space (for sports like basketball, tennis, volleyball, badminton and handball), open shade structures and benches. Water taxis will stop here, and there will be a town dock with day slips for small boats. Historical vessels may also be stationed here. Piers 98 and 99 will continue to be used by Con Ed and the Department of Sanitation. The view from Battery Park on Piers 25 and 26. Pier 34 contains two "finger" piers that link to the Holland Tunnel Vent Shaft. The southern finger is open to the public for strolling, sitting, blading or fishing. The northern finger is reserved as access for maintenance for the vent shaft. The view on the vent shaft of the Holland Tunnel on northern finger of Pier 34 from the Hudson River. Piers 60 and 61 and their head houses are operated by Chelsea Piers Management (www.chelseapiers.com) under a long-term lease as a sports and recreation complex, featuring a golf driving range, a marina, two ice skating rinks, a bowling alley, a track and gymnastics center, commercial excursion boating, television and film studios and restaurants. A public pedestrian walkway hugs the perimeter of each pier. Built in 1931, MV John J. Harvey, at 130 ft and 268 net tons, is the second most powerful fireboat ever in service on the East Coast of the United States. She has five 600 HP diesel engines, and has capacity to pump 16,000 gallons of water a minute. Her pumps are powerful -- enough so that when she and the George Washington Bridge were both brand new, she shot water over the bridge's roadway. She was retired by the New York City Fire Department in 1994 and bought at auction by her current owners in 1999. She was placed on The National Register of Historic Places in June 2000. The John J. Harvey fireboat at Pier 63 Maritime. 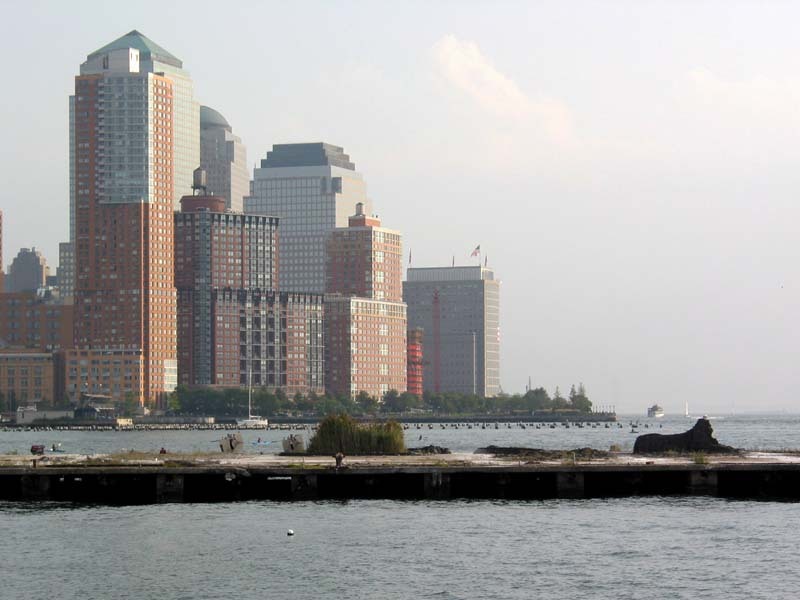 Battery Park North and the construction of 20 River Terrace on 14 September 2002, with Pier 32. Hudson River Park's Pier 45 on 29 May 2000. Delaware's tall ship Kalmar Nyckel at Pier 63 Maritime is visiting New York City for Sail for America. 14 September 2002. I like these pictures, and the historical descriptions. *This is a part of NY that you never hear very much about. On a pier poking 860 feet into the Hudson River and once used for such grinding work as shucking oysters and hauling freight, 25 young honey locust trees were quivering in a soft breeze yesterday and a thick cushion of grass stretched the length of one and a half football fields. That revitalized pier, two shorter piers nearby and the connecting Greenwich Village waterfront were christened yesterday by state and city officials as a park, the first portion of the long-talked-about transformation of the mostly ramshackle Manhattan waterfront that runs for five miles from Battery Park to 59th Street. Once finished, Hudson River Park, as it is known, will provide a waterside refuge to the tens of thousands of residents of TriBeCa, Greenwich Village, Chelsea and Clinton. "There's always been the notion that we would be recapturing the waterfront, but we never did it," said Adrian Benepe, New York City's parks commissioner and one of several officials who reached for superlatives to explain the event's significance. "Since the first Dutch merchants pulled in in 1624, the Manhattan waterfront has been commercial and the residents of Manhattan have been shut out of their river." But however high the hopes of reclaiming the waterfront, the project still faces uncertainties. Only $200 million has been allocated to finish all six park segments, a job that is estimated to cost twice that amount. "Without money, all the political will in the world won't build the park," said Tom Fox of Friends of Hudson River Park, a leading advocate of a river park. Critics have accused the park's builders of using green space as a Trojan horse for the commercial entertainment and recreation that will become available at some piers along the park, so conflict is sure to dog the park. The park's builders have yet to find places for the sanitation trucks and tow pound that occupy some piers. And while many environmental groups fought for the park's creation, others like the Clean Air Campaign say that it will harm the spawning grounds around the pier pilings used by striped bass and other species. The portion opened yesterday spans three-quarters of a mile of waterfront from Clarkson to Horatio Streets. It includes an esplanade landscaped with azaleas, begonias, trumpet creepers and a granite fountain as well as three precast concrete piers, at Jane Street, Charles Street and just north of Christopher Street. The Jane Street pier, with a jungle gym and prow, is essentially a playground. The Charles Street pier has artificial turf that can be used for kicking a soccer ball, and the Christopher Street pier, with its true grass lawn and long wooden benches, is intended for sunbathing and contemplation. From the end of Pier 45 near Christopher Street yesterday, the eye took in a broad gray swath of rippling river, the newly muscular skyline of Jersey City, the Statue of Liberty and a solitary mallard duck floating by. With Howard G. Abel of Abel Bainnson Butz as the landscape architect, the project used several structural approaches to create a sturdy park designed to resist the abuse of thousands of users for 50 years. According to Marc Boddewyn, vice president of design and construction for the Hudson River Park Trust, the park's builder and operator, Pier 45 is built on 1,200 concrete pilings ranging from 80 to 110 feet in length. Its platform rises for three feet at points to contain enough soil for the 25 locust trees, and the irrigation system encourages the trees' roots to grow laterally. The sun can be intensely hot on the pier — politicians came away with reddened faces yesterday — so shade is also provided by synthetic-fiber canopies. The railings are made of stainless steel to eliminate the need for painting. Residents of Greenwich Village have been longing for completion of the park, which will be open from dawn until 1 a.m. On Thursday, Elliot Smith, a 60-year-old art dealer, arrived at the park to walk Tchotchke, his chocolate Labrador retriever, and was disappointed that its opening had been delayed a day. He was stoic. "Everyone in the neighborhood has been watching with anticipation and impatience, but great projects take time to complete," he said. The Hudson River Park Trust's board includes five members appointed by Gov. George E. Pataki, five by Mayor Michael R. Bloomberg and three by the Manhattan borough president, C. Virginia Fields. It will raise money for maintenance through rents collected from commercial users on park property, like Chelsea Piers. To finish the project, trust officials hope to tap some the hundreds of millions of dollars made available to the Lower Manhattan Development Corporation after the collapse of the World Trade Center. If financing is found, officials believe the entire park can be completed in five years, Mr. Boddewyn said. As officials munched on barbecue and toasted each other and the park — Mr. Pataki called it "the Central Park of the 21st century" — considerations of money were set aside. Mostly officials were tickled at the idea of a park in the middle of the Hudson. "It takes a while for your mind to get used to it — to be walking barefoot in the grass and be over the river," Mr. Benepe said. "It's like a Sheep Meadow over the water." Restored bow notch. When ships became too large for the piers, several of these notches were cut into the bulkhead. The bulkhead wall is a NYC engineering landmark. The capstones that were too damaged to be used were incorporated into the landscape at several places. Pier 46. The lawn is artificial. I had my doubts, so a closer look. I was only sure when I tugged on a blade and it wouldn't come out. There is a bed of granular material that feels like soil. I live so close, I can't believe I haven't made it over there in months. I live really far. But I was there two weeks ago. I tell ya, that is a nice looking park. When it is all said and done, it should be an inspiration for crappy waterfront all around the city. *It would be nice if every area of the city had something beautiful like this. *Now, just get Pier 40 settled and that little matter of the $100 or so million, and we're good! Yeah, the money will be a constant issue. Like the Central Park Conservancy, people like Nicole Kidman and her Perry West neighbors, and Citigroup in Tribeca are going to have to step up. Oh God...that's absolutely gorgeous. *Makes me almost envy West Siders if they have such a lovely park at their disposal. *And those shots with Perry West really do the buildings justice. This project has had me as excited as any world record skyscraper. *I encourage forum members to visit. No expense was spared. *This is extremely high quality from construction materials to plantings. *Gorgeous! View south from pier 40. Segment 3 waits development. Hopefully, construction will start by 4th qtr 2004. But look at that bike path.